Life Extension Optimized Folate is a highest quality dietary supplement with optimised folate, i.e. a bioactive form of folic acid 5-MTHF (5methyltetrahydrofolate) in the amount of 5000 mcg in one vegetarian tablet. Bioactive folate ensures maximum support both for the health of the cardiovascular system and for cognitive functions. It is recommended to supplement 5-MTHF together with methylcobalamin (B12) and vitamin B6. Folate (pteroylglutamate) - also called folic acid, vitamin B9 or B11, synthesised by intestinal bacteria; its bioactive form is tetrahydrofolate (THF) which performs the function of a coenzyme in the reactions of the transfer of active monocarbon groups (methyl, formyl, formimino, methylene, methenyl groups). Why is "ordinary" folic acid not the right one? Commonly used folic acid, a component of many dietary supplement, has very limited effect on many people, as not every organism is able of converting the compound into the biologically active form 5-MTHF, which is caused by a genetic deficiency of enzymes that enable the conversion. That situation has very bad consequences for health and may lead to, among other things, a pathologically high level of homocysteine and cognitive function disorders. Moreover, a link has been found between folic acid supplementation and increased incidence of rectal, breast and prostate cancer as well as autism in children. Homocysteine is a sulphur-containing amino acid which occurs in the human organism as a result of demethylation of the amino acid called methionine. It is currently thought to be an independent risk factor in the development of atherosclerosis, the coronary heart disease, heart attacks and thrombotic disorders. The above-described changes are caused by impeded 5-MTHF synthesis by methylenetetrahydrofolate reductase which leads to functional folate deficiency and, in turn, to impeded remethylation of homocysteine to methionine. 5-MTHF (5methyltetrahydrofolate) - also called levomefolic acid; it is a biologically active form of folic acid and the main source of tetrahydrofolates for tissues. It plays a unique role in remethylation of homocysteine to methionine. The reaction is catalysed by methionine synthase, which is an enzyme dependent on methylcobalamin (vitamin B12). The consequence of the reaction mentioned above is the production of methionine, which reduces the level of homocysteine in the system, preventing the development of circulatory system diseases. Folate is one of haematopoietic factors which determine the normal process of erythropoiesis, i.e. the process of erythrocyte multiplication and differentiation (red blood cells) from stem cells in the bone marrow of flat bones and long bone epiphyses. Moreover, it has an important function in DNA synthesis, cysteine metabolism, synthesis of essential neurotransmitters (dopamine, norepinephrine and serotonin) and endorphins. Folate deficiencies lead to megaloblastic anaemia, which occurs as a result of impeded DNA synthesis that brings about blood cell maturation disorders. In addition, some disorders of the central nervous system may occur, which also needs the vitamin for the normal functioning - it has been demonstrated that about 30% of patients with mental disorders have a low concentration of folate in the blood. Folate supplementation is very important for pregnant women, as it is responsible for the normal development of the nervous system in a growing foetus. Folate supplementation before conception in the amount of 400 mcg per day can significantly reduce the risk of spina bifida and other defects of the foetus' neural tube. 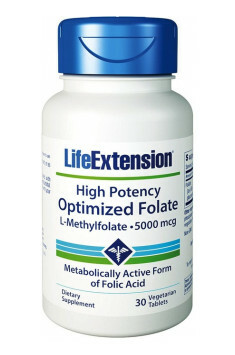 To sum up, Life Extension Optimized Folate is an obligatory product for people with methylation disorders, an increased level of homocysteine and for mothers-to-be. For best results, it should go together with methylcobalamin and vitamin B6 supplementation. Optimized Folate 5000mcg 30 tab. We recommend the use of folate in the planning phase of pregnancy. It minimizes risk of neural tube defects in the fetus. Natural sources of folate are dark green vegetables, whole-grain, legumes. But these compounds are very unstable and easily degraded by the technological processes. Coconut oil spray. Allows you to fry meals without added calories and prevents their sticking to the pan.